The Subramaniam Academy of Performing Arts (SaPa) invited the Peace Run to India to spend a week visiting schools in Bangalore. The runners had wonderful experiences visiting students and teachers, as well as seeing the incredible sights of India. We wish to extend our heartfelt thanks to Bindu and Ambi Subramaniam for organizing the school visits with the invaluable assistance of their teams, including Chithkala, Prasanth, Vivek and many others (including Mahati!). We would also like to congratulate and thank both Dr. L Subramaniam and Kavita Krishnamurti Subramaniam, both recipients of the Torch-Bearer Award. In 1980 Sri Chinmoy ran the 47-mile race for the 2nd time with a time of 11:27 h, which transcended his time from the previous year. Utpal Marshall also ran the race that night for the 3rd time. He was able to complete the race in 6:19 h and then get out his film camera to record this footage. Relax and and enjoy the beauty of the sea around Honolulu. Soundtrack by Parichayaka Hammerl; filmed and produced by kedarvideo, Switzerland. In August 1993 Sri Chinmoy dedicated an open-air concert in Jamaica, Queens (NY) to Swami Vivekananda, shortly after he visited the Parliament of World Religions in Chicago, a multi-confessional international gathering initiated by Vivekananda some 100 years ago. Filmed by Kedar Misani, Switzerland. 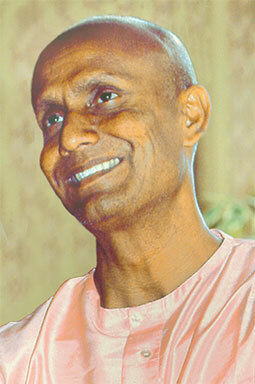 Sri Chinmoy spent most of his time on a tennis-court in Jamaica, Queens, NY, which later was renamed as “Aspiration-Ground”. This is a meditation during the August birthday celebrations, while his students are singing a selection of his songs. Filmed by kedarvideo, Switzerland. vn. On his 3rd visit to Europe within two years, to officilly release the French, Polish and Romanian translations of his widely acclaimed book “Gandhi’s Outstanding Leadership”, former Ambassador of India Pascal Alan Nazareth (81) (https://www.youtube.com/watch?v=VHJ0kUN_R8I) made it a point to take part in the September gathering of 250 international members of the Sri Chinmoy Centres in the small town of Furth im Wald near the Czech-German border. He will be continuing on to Prague, Vienna, Warsaw and Geneva for his book releases, including lectures on “Gandhi for the 21st Century” and a keynote speech at the UN Library in Geneva on Oct. 2nd, in honour of the UN International Day of Non-Violence. Aware of the importance of the power of spirituality for a more peaceful world – a vision he is going to share also in a forthcoming second book – Ambassador Nazareth enjoyed the meditative atmosphere of the meeting and gave an inspiring talk about the “spiritualization of revolution” he sees in Gandhi, and the “revolutionaries of love” – among which he also counts Sri Chinmoy and his students worldwide with all their activities, including the Sri Chinmoy Oneness-Home Peace Run, which is currently celebrating its 30th anniversary. Alan elaborated on Gandhi`s legacy and spirituality and on Sri Chinmoy`s quote that “World-peace can be achieved, revealed, offered and manifested on earth when the divine Power of Love replaces the undivine love of power.” “Spirituality”, Alan explained, “is something very simple. Spirituality means to connect to the divine within each us”, far beyond the boundaries of religion, in order to contribute to a better and more peaceful humanity. The European Peace Run then proceeded to present Ambassador Nazareth with the “Torch Bearer Award” of the Sri Chinmoy Oneness-Home Peace Run, honouring his long standing efforts as diplomat, lecturer, author, founding member and Managing Trustee of Sarvodaya International Trust to spread the ideals of non-violence, humanitarian service and peace. Background: In 1967, when Alan Nazareth became the new Consul at the Indian Consulate in New York, young Chinmoy (1931-2007) was still working there for some months after coming to N.Y. in 1964. As Alan Nazareth admitted, at that time he had no idea the humble and sweet clerk working in his office would become a “spiritual atom bomb” only within a few decades. Over the years a deep inner relationship developed between them, and in 2007 Sri Chinmoy honoured the Ambassador with the U Thant Peace Award. Kaneenika Janáková has completed the world’s hardest run. She told The Slovak Spectator about her career, but also about the place where she likes running in Slovakia. Read the full interview here. Experience Sri Chinmoy in high meditation, filmed during a poetry reading in Stockholm in 1990 by kedarvideo, Switzerland. Sri Chinmoy: The colour silver does have a special significance which is applicable in any field. It means purity. When one sees this colour during meditation, one has to know that he has achieved tremendous progress in his life in terms of purity. When you see the colour silver, at that time you have to feel that your mind is becoming pure, your vital is becoming pure, your body-consciousness is becoming pure. Silver is purity. This also applies to the colour silver in art.